Fatigue is frequent in patients with psoriasis. Though conventional drugs in general have no effect on fatigue, biological agents have demonstrated beneficial effects in several other chronic inflammatory diseases. The objective of the present study was to evaluate the effect of biological drugs on fatigue in patients with psoriasis vulgaris. 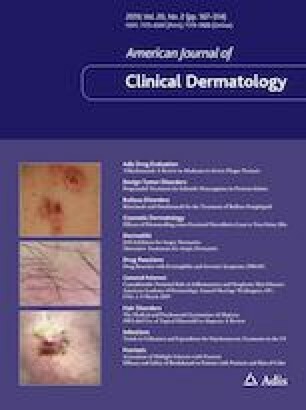 We conducted a meta-analysis of randomized controlled trials in which anti-interleukin-12/23, anti-interleukin-23, anti-interleukin-17, or anti-tumor necrosis factor-α agents were used for psoriasis vulgaris and fatigue was an outcome measure. A total of eight randomized controlled trials fulfilled criteria for inclusion in the meta-analysis. The studies used two fatigue reporting scales: the Functional Assessment of Chronic Illness Therapy-Fatigue and the Short Form 36 Health Survey Vitality Subscale. Treatment by biological agents in general compared with placebo led to a significant reduction in fatigue, with a standardized mean difference of − 0.40 (95% confidence interval − 0.46 to − 0.34; p < 0.001). Biological drugs used for the treatment of psoriasis vulgaris have a consistently small-to-moderate beneficial effect on fatigue independent of the type of drug. The online version of this article ( https://doi.org/10.1007/s40257-019-00434-w) contains supplementary material, which is available to authorized users. The authors thank senior librarian Elisabeth Hundstad Molland at the Stavanger University, for providing expert help with the PubMed search. Inger Marie Skoie received support as a doctoral research fellow from the Western Norway Regional Health Authority (“Helse Vest”), Grant No. 912015. Inger Marie Skoie has received honoraria for participation in advisory boards and/or as a speaker for AbbVie, Janssen, Eli Lilly, Leo Pharma, and Pfizer pharmaceutical companies. Ingvild Dalen and Roald Omdal have no conflicts of interest that are directly relevant to the content of this article.